Lolade Siyonbola, the black Yale student who had the police called on her by a white classmate for napping in a common room, said she wants the university to hold that classmate and others like her accountable. 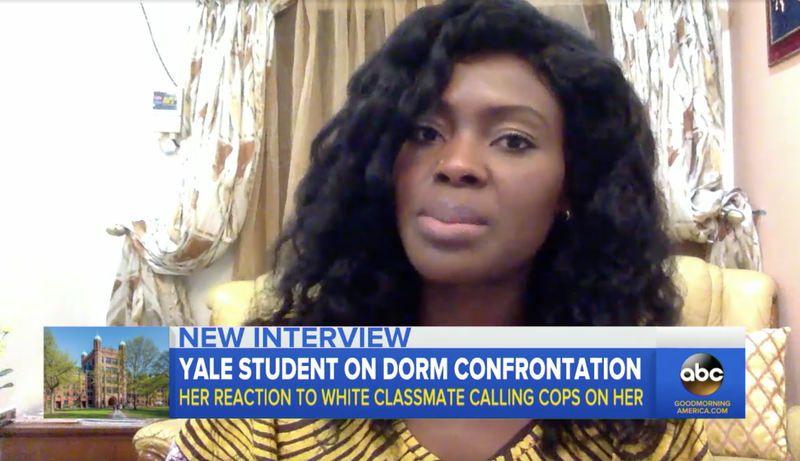 In an interview with Good Morning America (h/t Time magazine), Siyonbola spoke out about her run-in with Sarah Braasch, a white Yale grad student and feminist scholar who called campus police after seeing Siyonbola asleep in a common room. Siyonbola had been working on a paper. While waiting for the police to arrive, Siyonbola filmed a portion of her exchange with Braasch. “I have every right to call the police. You cannot sleep in that room,” Braasch could be heard saying on the video as she snapped photos of Siyonbola. Siyonbola told Good Morning America that she posted the video for her safety. “I have always said to myself since Sandra Bland was killed—I said to myself, ‘If I ever have an encounter with police, I’ll film myself,’” she said. The Good Morning America report noted that Braasch had created and escalated confrontations with black students before. As the Yale Daily News first reported, Braasch had called campus police on Siyonbola’s friend, another Yale student, earlier in the semester after he got lost in their dorm building trying to find a meeting room. Reneson and Siyonbola submitted a complaint about the incident to university administration in March, which Reneson says went unanswered until this past week. Yale has made a couple of statements since the common room incident, including one from the vice president for student life, Kimberly Goff-Crews, who said that she was “deeply troubled” by the incident. Goff-Crews said that the university would hold listening sessions with students to determine how to avoid similar events in the future. There’s been no word from the university about how or if Braasch will be disciplined for her actions. In an earlier interview with the Yale Daily News, Siyonbola criticized Yale’s response to the incidents.